Simcovich herself is from Argentina, having barely escaped her home country shortly before the 1976 military coup which lead to a dictatorship that lasted until 1983. Recently she connected with this young group from Buenos Aires which plays the music that people of her generation were either not able to play or not interested in playing. Earlier this summer I became interested in Simcovich’s background and interviewed her. What I learned about her story – of being an Argentinian composer with a Jewish background and now living in San Francisco – was so captivating that we ended up talking for four hours. Needless to say, only a fraction of what I learned that evening made it into my blog: https://andreastangosite.com/2016/06/30/music-with-a-punch/. She told me that the orchestra was in the middle of recording her second album, El Mundo is the World, and that they would return for another tour on the West Coast to promote this new album in November. When I learned later that the band was actually arriving in New York first, and spending a few days there before the major part of their tour began in California, I innocently asked if they were interested in performing in Upstate New York. Their immediate reply was “Yes!” I quickly discussed the possibility of extra performances with my partner and we agreed to look for some New York venues. The National Museum of Dance in Saratoga Springs was quick to host a concert this coming Friday, November 4. Equally keen was the Bearsville Theater in Woodstock, where the group will perform the following evening, on November 5. Since there is a widespread tango community in the Hudson Valley, we figured there would be enough people interested in the rare opportunity to hear a young and authentic twelve-piece orchestra from Buenos Aires. 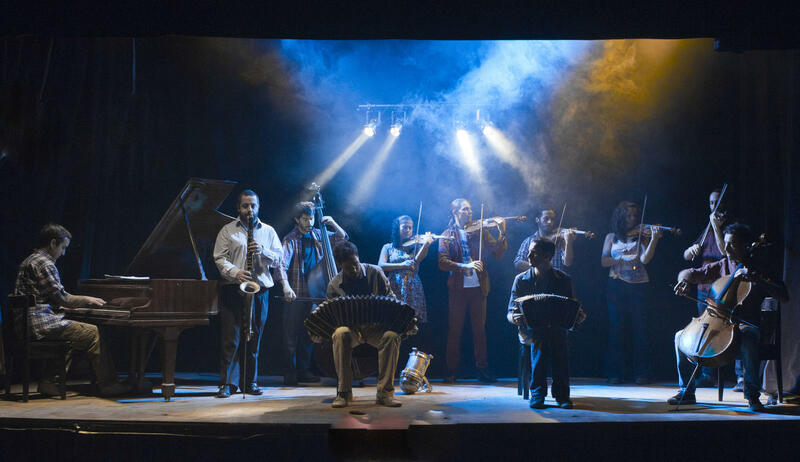 We certainly hope that enough people with an interest in Argentine tango music delivering a strong social and political message will come and listen to what is going to be predominantly a concert, but which will also offer the opportunity to dance. It’s been a lot of work getting the word out and organizing the upcoming two concerts. Communicating with the group, which is based in Buenos Aires, hasn’t always been easy. But I finally managed to reach the orchestra’s founder and manager, Ezequiel ‘Cheche’ Ordóñez (who by the way is the grandson of chess grandmaster, Miguel Najdorf), and attempted to conduct an interview with him first by Skype and then by phone. Unfortunately, the connection between Woodstock and Buenos Aires was so bad that we could barely hear each other and we finally gave up, agreeing that I would send him my questions by email— to which he then responded in writing. AB: How did you discover tango for yourself? EO: Like most young musicians in Argentina I first discovered tango through Astor Piazzolla, and then through Roberto Goyeneche, Ánibal Troilo, and Horacio Salgan. AB: What is your actual musical background? EO: As a youth I studied classic piano, then in secondary school I studied conducting, and then began my career working as a tango pianist. About ten years ago I began to teach myself bandoneon. AB: How did you get the idea to form an orchestra? EO: Like Alejandro Drago (our pianist and arranger) I had a quartet, and we both needed to find a more orchestral sound, above all with more strings. AB: How do you select your pieces? EO: In general it depends on the particular project we’re involved with, but we always try to keep the compositions and arrangements in line with the orchestra’s identity. AB: What is most challenging about managing a 12-piece orchestra? EO: Everything, hahaha! Transportation, lodging, hospitality — everything is difficult and expensive, hahaha! AB: Have the members changed overtime? EO: Yes, six of us have remained the same since the beginning but the rest have changed. AB: What kind of tango do you personally prefer (traditional/modern)? EO: Mmmm, traditional, but with more modern arrangements, but still respecting the basic tango style, above all the rhythm. AB: Tell me how you met Debora Simcovich and how your relationship has evolved? EO: She heard us in Buenos Aires at our milonga at Café Vinilo and suggested we record her music. We listened to her work and it seemed very interesting. From there we became good friends and now we’re presenting a second album of her music. AB: Aside from Debora’s compositions, have you recorded other tango music? EO: Yes, a lot. The orchestra already has three other albums of traditional material as well as our own works. AB: What is it like to perform for a concert audience versus a dance audience? EO: It’s very different. For a concert we choose a repertoire suitable for the room, for a milonga we pay more attention to rhythm and danceable numbers. AB: What are your expectations for the upcoming US tour? EO: The truth is that fortunately this is already the second time we’re coming. Last year everything was marvelous: the theaters, the production, the people, everything. We’re hoping this year will be the same and we’ll be able to return many more times. I hope it works out.